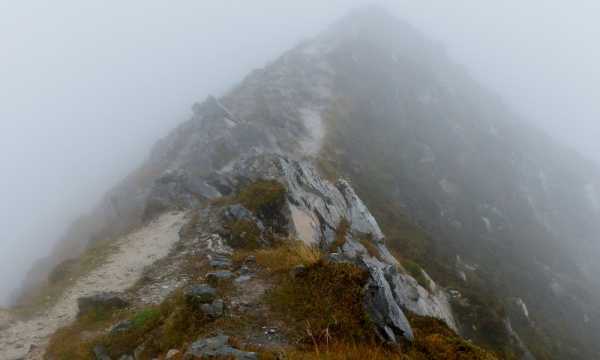 I climbed Mt.Errigal on 12/09/11 contending with the remnants of hurricane Katia. Probably the craziest thing I've ever done (and that's saying something!) especially as I did it alone. I'm pretty certain I was the only lunatic to climb the mountain this day. It was no suprise that I didn't see any other walkers on my climb. There were winds of up to 76mph recorded around Northern Ireland that day, but they would have been recorded at lower levels. I would love to know what the wind speed was at the summit of Errigal because it was noticably more powerful up there. The mountain was shrouded in mist and cloud so visibility was poor. I had been planning to climb it on this day for a few months and was returning to London the next day so couldn't postpone it and I wasn't going to let a little wind ruin my day! I set off from the car park across some really boggy heathland. It had rained everyday for the week I was in N.Ireland and today was no different. I thought about calling it off as I had already stepped into a bog almost knee deep and my feet were muddy and drenched - but didn't want to quit so soon, so onwards I climbed! The gusts of winds increased in strength as I reached the scree part of the mountain, not only was I walking uphill, I was walking into 80mph+ head winds which made it more tiring. I had to drop to the floor and hug the ground every time a strong gust pushed me. I began to realise how dangerous this really was. When I got to the ridge near the top (pictured) that dropped off both sides, I sat on the ground for a few miutes clinging to a boulder and seriously thought about turning back, even though I was only 25m from the summit. The wind was howling constantly from left to right over the ridge and I knew one gust could push me over and I would be a gonner. I had come to far to turn back though and Im not ashamed to say I crawled over the ridge on all fours. Yes, I made it, I stayed at the top only long enough to take a picture of myself as I was tired, wet, freezing and aching. I crawled back over the ridge and started my descent which felt more dangerous than the climb as the wind was now pushing me in the back as well as gravity pulling me down. The gusts were forcing me to run and knocking me off my feet, literally. Lots more floor hugging on the way down.